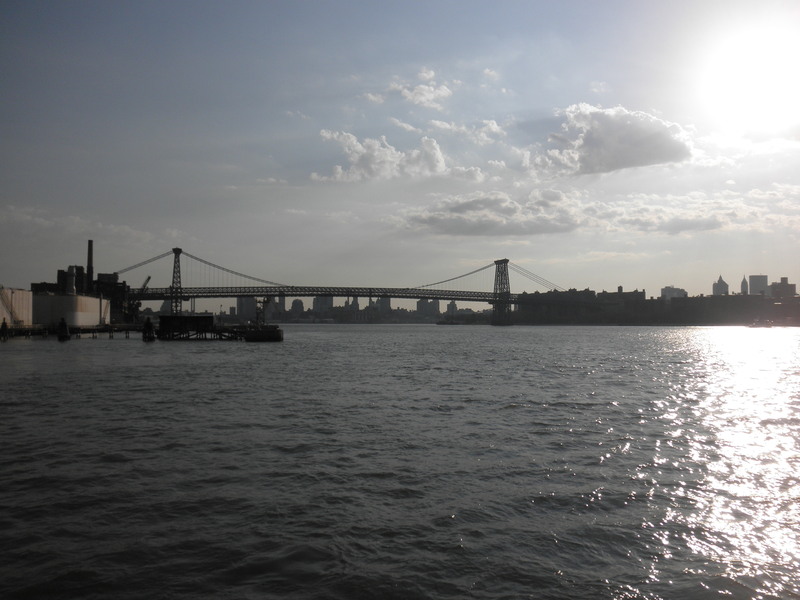 The Manhattan skyline across the East River. This trip actually happened over a week ago, but the whole earthquake thing happened, and that pretty much monopolized this blog for three straight postings. A couple of Saturdays ago I visited a high school pal, Mike, in New York City. Currently a full-time resident of L.A., he is working in the Big Apple part-time. Since Lisa was in Japan (see previous three posts) I decided to take the MegaBus to visit him in NYC. Prior to moving to L.A., Mike lived in New York for over a decade, so he knows a thing or two about the city. My favorite way to tour a place is with someone who knows the ins and outs, and avoid the tourist traps. For instance, I have been to NYC nearly 10 times, but have yet to see the Statue of Liberty. 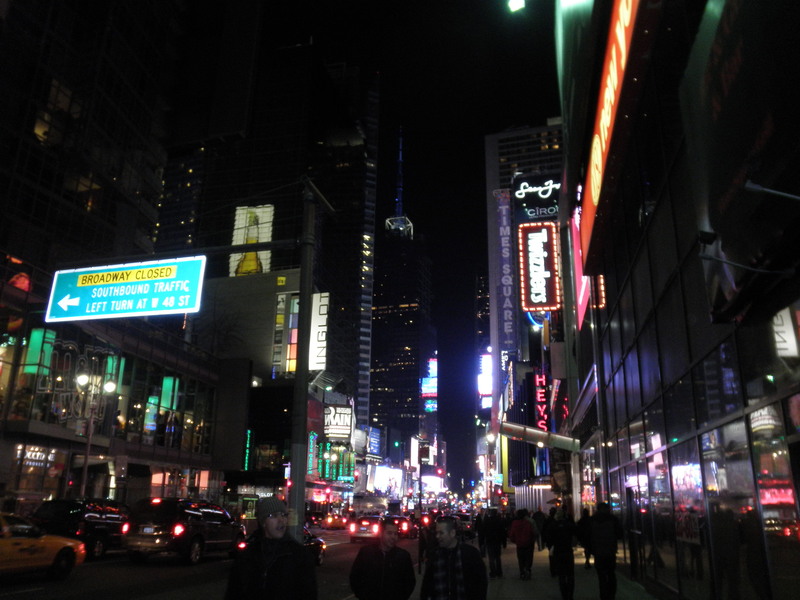 Midnight in Times Square in 2011. To give even further example, Mike and I visited NYC for the first time back in ’98. He was looking for an apartment, and I had nothing better to do. We were both 19 years old at the time, and had learned that without cash, all of the bars were forbidden to anyone 21 and under. Except for the strip clubs. As Mike reminded me, the exact name of the establishment is Runway 69, and he still knows where it is. Well anyway, they let us 2 hicks in that strange night back in ’98. We were in teenage heaven. They served us beer and there were girls who were nice to us. No, but we were still tipsy on life. After an ill-advised trip to the ATM, we became separated and didn’t catch up with each other until we met up at the youth hostel. This was in the days before cell phones. We somehow survived. Fast forward 13 years, we are a little wiser, have a little more money in our pockets and are allowed inside bars without showing I.D. We started our 2011 jaunt at Virgils’ Barbecue just outside of Times Square. Mike told me they had the “best wings ever.” I concur. As the bartender explained to us, the wings, which are the full wing – bicep and forearm – are smoked for two days before serving. When they are ordered, the wings are thrown on the grill for five minutes and smattered with Virgil’s homemade BBQ sauce. They are never fried, and the meat fell apart in my mouth. Not only that, the wings were less than $12. The day was off to a good start. Mike was flabbergasted by the change. He pointed out where the hookers used to hang out and where they used to slip through a chain link fence to smoke next to the river. 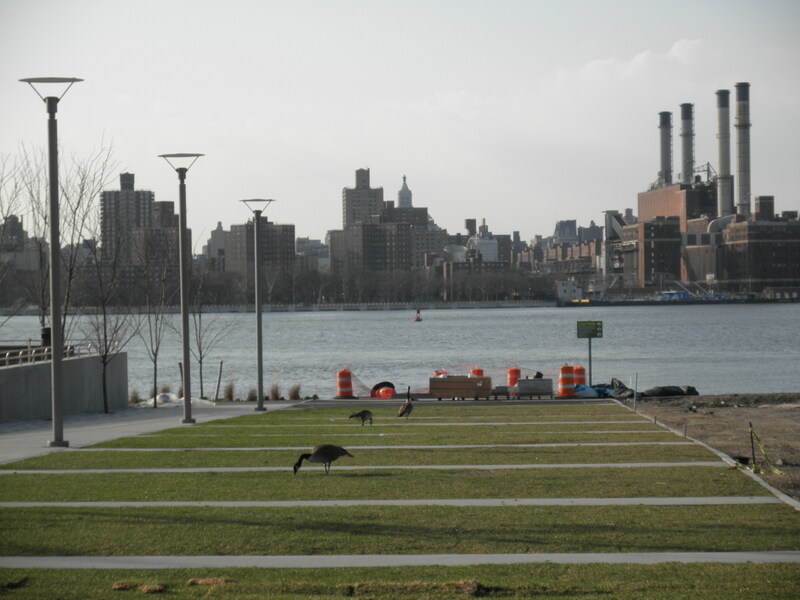 Now there is a manicured park and a serpentine, metal sculpture. After gawking at the scenery like a couple of lost frat boys, we regrouped and stopped by an Irish pub where Mike and his buddies used to hang out, and we got a 32 oz. Budweiser in a styrofoam cup. A toothless man who looked like he belonged in Arkansas tended bar, while one other bearded dude our age sat alone watching an Angelina Jolie movie. The 32 oz. of beer went down surprisingly quick. We continued our bar crawl by revisiting an establishment that used to be known as Kokies. It slightly resembled its former self, but was missing the curtains, and they opened up the back patio. After a Corona, we took a cab to The Freedom Tower, currently under construction. This is the skyscraper being built on the site of the former World Trade Center. This is still such a sentimental place. 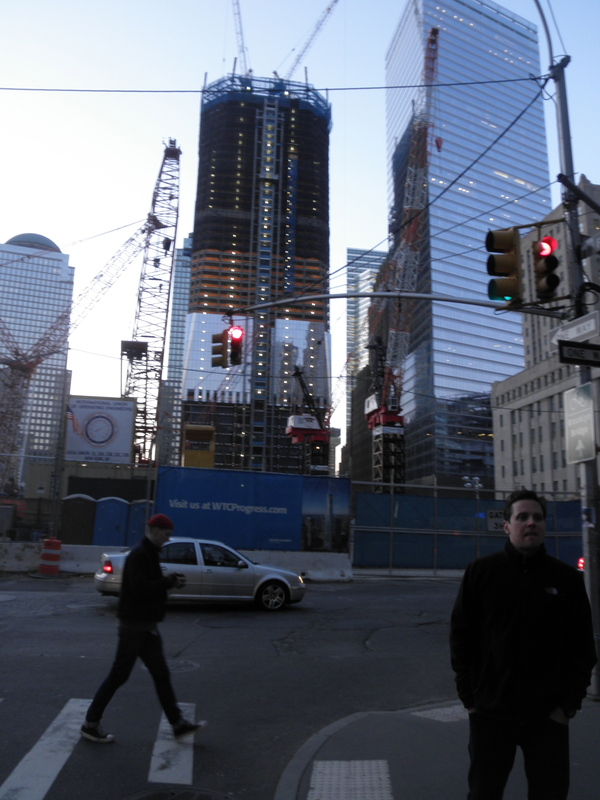 Aaron Dabney and I visited the site of the World Trade Center in late December of 2001. The crater was still smoking. The enigma continues to stop me in my boots, the feeling of hatred, violence and terror hangs in the air, and is rather overwhelming. 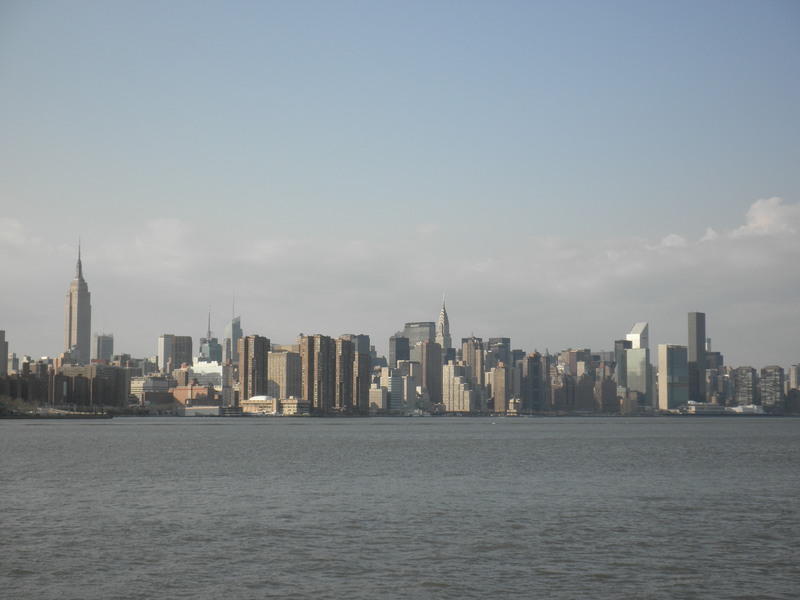 We took a few pictures and continued our caravan on foot north through Manhattan. We passed through The Highline Park, a new gardened walkway built on an old railroad track two stories above the city. We stopped for dinner at a restaurant, whose name I can’t remember, because it was fairly unmemorable. 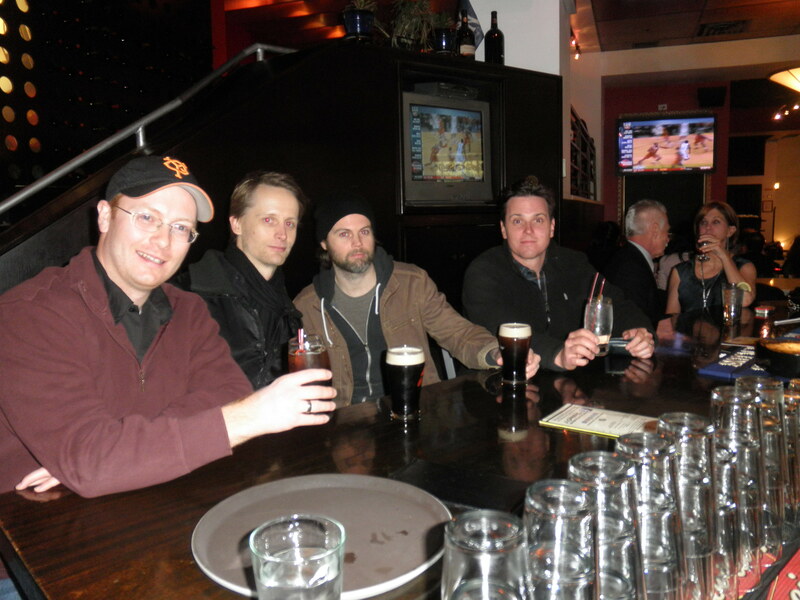 Then we made our way to Time’s Square where we met up with fellow CF High alum Nick Mullan and his brother Alex. We had a few cocktails before catching the midnight performance of comedian Paul Mooney. Mooney is best known as the quasi-black-swami on the now-defunct Chapelle Show. He didn’t start his set until after 1 a.m. He started out pretty witty. Making fun of white people and other bureaucratic indiscrepancies of American society. As part of the minority white population in the theater, we laughed heartily. After a couple of hours, we realized Mooney was just saying whatever came off the top of his head, and most of the crowd had left. It was 4 a.m., and time to wrap it up. It was a good time, but we were old, and needed our rest. Which one is the tourist from Iowa?